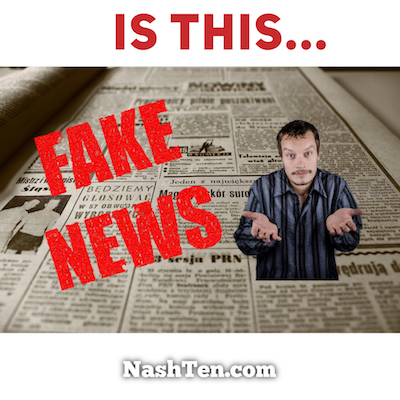 I wanted to share some more reasons to be wary of what you read in the news about real estate. Earlier this week, I provided some examples of how these stories are confusing and even contradict each other. Today, I want to share an example of something that is completely wrong. Now before you declare, “FAKE NEWS,” this mistake was most likely caused by ignorance and not malice. Most real estate reporters cover all business stories so they do not understand the real estate market like an insider. Their job is to sell papers, so they write the stories to do just that. Here’s the false storyline that I’ve seen a few times this week. These stories covered the slowing down of the market and the transition away from a seller’s market. These type of stories usually give a false impression that the market is bad. Slowing does not equal bad. And in this case, it is healthy for Nashville to slow down after three years of intense pressure on buyers. Another fallacy that was repeated is a slowing market must mean a buyers market is around the corner. And nothing could be further from the truth. Technically, we are still in a seller's market. However, supply and demand are moving closer together, which means we are transitioning to a balanced market. Bet you haven’t read that term in the news lately. Balanced markets tend to have the least amount of stress for both buyers and sellers because no side has the upper hand. The balance brings harmony and gives people the chance to consider their options without feeling rushed. If you’ve been sitting on the sidelines waiting for the smoke to clear, here’s your chance. And if you want to know the truth about the market in Nashville, then hit reply and I’ll fill you in. Check out the Daily Deal in Nashville. This cute, move-in ready cottage in East Nashville is great for an investment or first-time homeowner and is listed for less than $240,000.